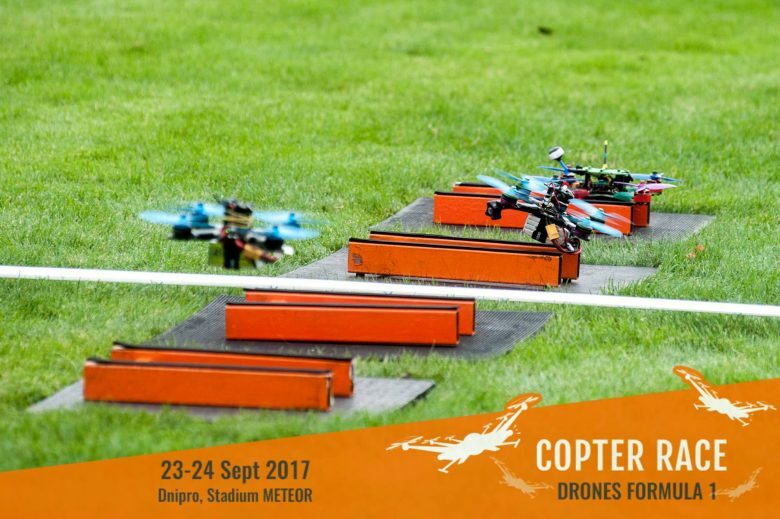 On September 23-24, at part of Noosphere’s traditional Copter Race, a stage of FAI Drone Racing World Cup in F3U class was held at the Sport Complex “Meteor” for the first time for Dnipro. 40 pilots from 4 countries (Poland, Switzerland, Germany and Ukraine) competed during this spectator drone-battle. Noosphere hosted its first-ever event of drone racing in September 2015. Association Noosphere has held 5 competitions among drones pilots so far. For the first time, Dnipro became one of 16 cities around the world to host a stage of the FAI Drone Racing World Cup in drone racing this year. The competition was supervised by 2 judges from Ukraine and Italy – Dmytro Franchuk and an official FAI representative from Italy, Oscar Chinello. “Drone racing is the youngest and fastest growing air sports discipline. The World Air Sports Federation (FAI) just certified it in 2016, and the rules of racing and the regulatory instruments are still being formed. As a technical partner, we are working hard to help the FAI in this. This year, Association Noosphere organized Noosphere Race Cup, a drone racing World Cup stage, where the automated scoring system, CupNavigator was successfully live-tested in this new discipline,” said Max Polyakov. On the first day of competition, drones pilots were required to meet the qualifications. Despite the bad weather that caused some technical issues, all participants remained positive and were looking forward to the main part of the tournament. In addition to official competition qualifications, the first day of the event also marked the Fan Сopter League, competitive races for amateur pilots, where everyone from young to old could operate a drone as a real pilot, and Free Style – a stunt flying competition. The crowds were fascinated!Viewers could not take their eyes off the loop de loops, back flips, stunts and dive-bombers. The first day wrapped up beautifully with the first ever night show-race of drones in Ukraine, where the whole field was aglow with a myriad of colored lights. In addition, Victor Dzenzel also received a prize from the organizers of the aeromodelling association KAMA KOREA of $1000 to cover his transportation costs for 2017 FAI DAEGU DRONE RACE WORLD CUP, as he will represent Ukraine in this competition. As this event was not only meant to be a competition, but also a family holiday weekend, there were also various workshops, exhibits and game zones for children. Kids had fun playing with drones, building model rockets and participating in various contests. Check up Copter Race FB page and website for more insights and photos! Stay tuned!